Thursday, I went to the Open House for my new show at Shoreline City Hall. I’d like to say we had a huge turn out, but most people I know are still at work at 5pm, and not so close to Shoreline either. 😦 But… I had a good time anyway, and it was great to see my work up on the walls! Here’s some of the work. It’s up until the end of July. 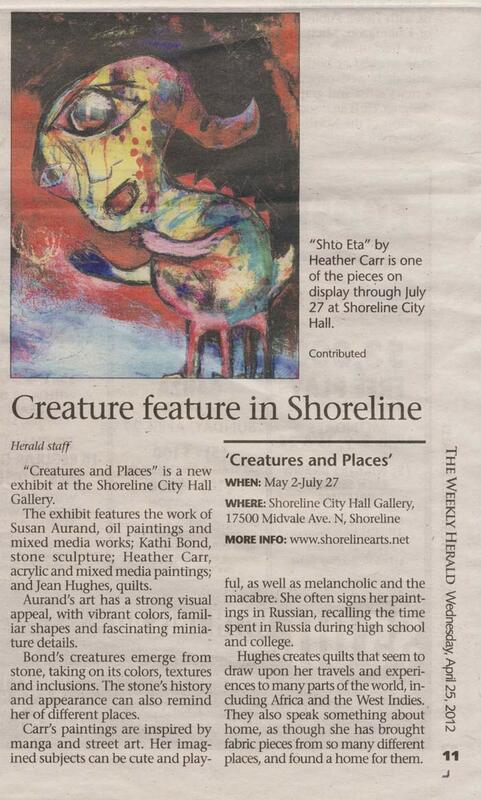 There was a small piece in The Weekly Herald (05/25/12) about our show, and they printed one of my paintings for the article. It was quite a surprise! This entry was posted in General, Paintings, Sketches and tagged art, art show, Arts, doodle, Drawing, dreamy, eyes closing, girl, Illustration, pencil, Shoreline City Hall, Shoreline City Hall Gallery, sketch, Sketchbook, Weekly Herald, woman by heatherunderground. Bookmark the permalink.